Originally published in Developing Green Communities. 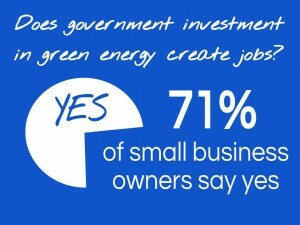 Small Business Majority released the results of an opinion poll last week that showed that small business owners are overwhelmingly in support of government investments in renewable energy and clean energy policies. The poll surveyed 600 small business owners in Colorado, Michigan, Nevada, Ohio, Pennsylvania, and Virginia. Among other results, the poll showed that 71% saw government investments in clean energy as a job creator. And 76% of the owners agreed that the EPA should determine the limits on new power plants’ emissions of greenhouse gases. To see more of the results of this survey check out this article by the CEO of Small Business Majority on Huffington Post. This entry was posted in Economic development and tagged energy finance, government investment, green jobs, public policy, small business. Bookmark the permalink.